Looking for a new routine for your new-years gym resolution? This SuppVersity article offers suggestions that will pay off in form of strength gains. For the rookie, everything works. If you have more than five years of series training experience under your belt, however, you will be progressing much slower - often frustratingly slow(er)... This is why the results of a a soon-to-be-published study in the Journal of Strength and Conditioning Research are particularly interesting. In contrast to your average resistance training study, the subjects of this study belonged to previously described group of experienced trainees. With a mean training experience of more than 5 years, the initially more than 300 volunteers were thus significantly more representative of the average SuppVersity reader than the "recreationally trained" subject who goes for a jog once a month. The method used int he study is an alternative to classic periodization schemes. What was likewise remarkable about the study at hand is the number of participants. Ok, after 67 dropouts, there were only 200 subjects left when the author, Christoph Eifler from the Department of Applied Training Science at the German University of Applied Sciences for Prevention and Health Management (DHfPG) in Saarbrücken, Germany, kicked out another 33 subjects to get identical sample sizes and a homogenous gender distribution in all study groups. N=200, however, is still far from what the average resistance training study has to offer. Table 1: Study design: constant and variable loading parameters (Eifler. 2015). CL - constant load and constant volume of repetitions over 6 weeks. IL - increases in load and decreasing volume of repetitions made every 2 weeks. DL - decreases in load and increasing volume of repetitions made every 2 weeks. DCL - daily changing load and volume of repetitions. The total number of repetitions were identical between samples. In addition, both within- and between-set rest was standardized between samples, to isolate the variables of interest (i.e. intensity and volume). What's the mechanism? While we cannot tell for sure what triggered the increased strength gains in the study at hand, the author's suggestion that "[i]t is possible, that the ongoing alteration between training intensity and training volume prevents habituation effects, at least in short-term resistance training periods" (Eifler. 2015) constitutes a very convincing hypothesis, also in view of the fact that we may assume that "this loading scheme [DCL] places greater stress on the neuromuscular system, so greater strength gains are the result" (ibid.). Supporting evidence for this hypothesis comes from Rhea et al. (2002) who reported as early as in 2002 that DCL-like loading periodization-schemes support a greater adaption of the neuromuscular system. "Both 10-RM-testing and 1-RM-testing were designed with the following procedure: 5 minute general warm-up with an intensity of 60% of the theoretical maximum heart rate; one warm-up set with 50% of the load in the first test set; performance of 3 at most test sets to quantify RM (trial and error principle) by 3 minutes rest interval between test sets. Pre- and post-testing occurred at the same time of day to eliminate the potential influence circadian rhythm on strength. The documentation of the test results followed standardized test protocols. At each date of testing, all participants were interviewed about their current state of motivation and their form of the day. Moreover, the temporal gap between the last resistance training session and the presence of muscle soreness and muscle stiffness were recorded" (Eifler. 2015). Familiarization sessions were unnecessary as subjects had recent experience with all exercises, i.e. horizontal leg presses, chest presses, butterfly, lat pulldowns, horizontal rows, dumbbell shoulder press, cable triceps pushdowns, and dumbbell biceps curls, they had to perform in the given order and over the full range of motion (ROM) in each of their workouts. 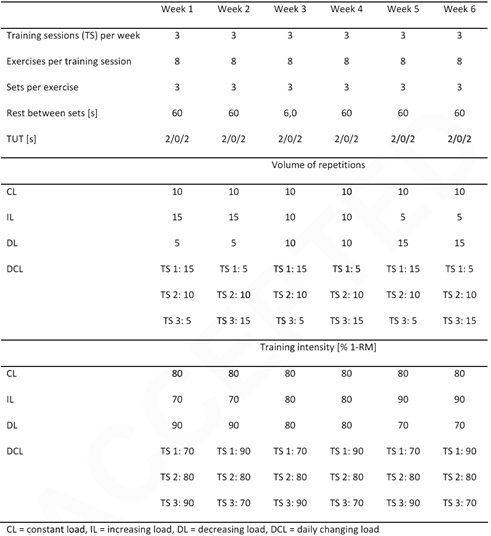 Figure 1: Effect sizes of the 6-week training intervention with different loading schemes (Eifler. 2015); * denotes significant differences compared to all other groups - in short: only the DCL workout made a significant difference. Even though using trained and highly motivated subjects obviously has its advantages, the author adds for consideration there may be selection effects caused by voluntary participation or Hawthorne effects (Macefield. 2007). More specifically, the volunteers in the study at hand were probably (just like you ;-) more likely to comply to changes in behavior and to put maximal physical effort in testing and training. In addition, even though the subjects were told to refrain from additional physical activity and to maintain their regular diets, not all confounding variables, such as differences in nutritional intakes, prior sleep, or interferences caused by other fitness club customers, could be eliminated in this field test study. 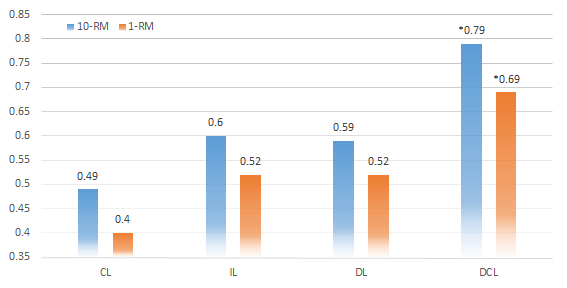 Figure 2: Relative strength increases in the four study groups (Eifler. 2015); due to the large inter-individual differences, evidenced by the long error bars, the DCL advantage was not statistically significant. As Eifler rightly points out, though, "the probability of occurrence of these confounding variables, selection effects or Hawthorne effects, is equal in all samples" (Eifler. 2015), which is why they should average out when you compare the inter-group effect sizes and relative strength increases based on the pre vs. post 1-RM and 10-RM strength test (see Figures 1 & 2). Overall, there's thus little reason to doubt the results of the study at hand. 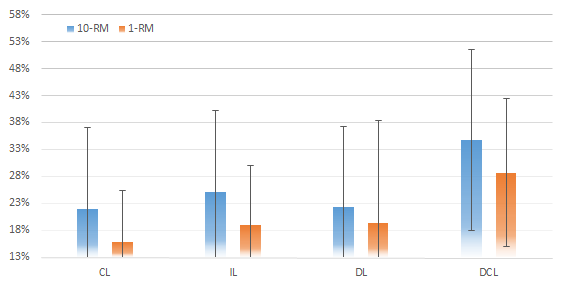 Results that clearly suggest an advantage of the daily changing load regimen when it comes to maximizing strength increases in trained individuals over the course of a six-week period - and that in spite of the fact that Eifler failed to detect statistically significant effects for the relative strength increases due to the large inter-personal differences (see Figure 2). This is not the first SuppVersity article discussing evidence in favor of "changing up things more frequently". Back in 2012 I already discussed Spinetti's linear vs. undulating periodization studies w/ similar benefits on the subjects' strength gains. So what's the verdict, then? Just as the author says, while DCL is widely known, the fact that it is rarely practiced may have average and extraordinary gymrats miss out on a "potential for improving resistance training in commercial fitness clubs" (Eifler. 2015). 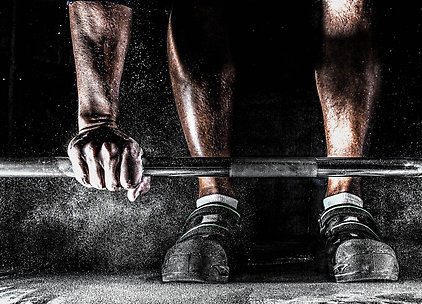 After all, there's little doubt that the data from the study at hand "indicates that resistance training following DCL is more effective for advanced recreational athletes than" (ibid.) more conventional loading patters, i.e. CL, IL, DL. Whether the benefits are due to a novelty effect that would be lost over long(er) training periods and whether the same or similar benefits could be achieved in untrained subjects will have to be determined in future research, for the time being however, daily changing load (DCL) and volume of repetitions appears to be worth adding to your list of things to try in the gym in 2016 | Comment on Facebook! Eifler, Christoph. "Short-term effects of different loading schemes in fitness-related resistance training." The Journal of Strength & Conditioning Research (2015). Macefield, Ritch. 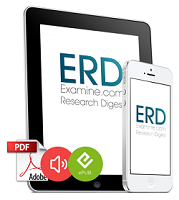 "Usability studies and the Hawthorne Effect." Journal of Usability Studies 2.3 (2007): 145-154. Rhea, Matthew R., et al. "A comparison of linear and daily undulating periodized programs with equated volume and intensity for strength." The Journal of Strength & Conditioning Research 16.2 (2002): 250-255.